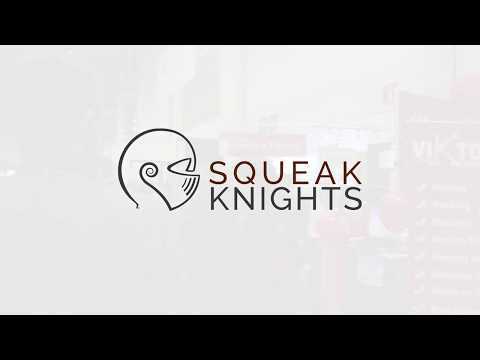 Squeak Knights is fantastic. They silenced a very squeaky section of the hardwood floor in our kitchen. We were afraid that we would have to tear up the floor to fix it. Then came Squeak Knights. The repair was fast, professional and invisible. We are super impressed! Richard, it's been a pleasure working with you! Glad to have been able to be of service. Called around for a solution to squeaky stairs and floors for my home built in the 1960's. Didn't want to have to tear out nice old floors. To my surprise, Squeak Knights was recommended to me by a flooring retail store. Could not be any happier with the results. I've recommended to at least 3 of my neighbors. Deafening squeaks deep inside ceilings - fixed! Lev and his team identified flaws in constriction of a newly purchased 5-year old custom home relating to the floor joists. The sound caused when walking across vast sections near the middle of the house was horrific. Issue was quickly diagnosed and repaired and now the sound is 100% GONE! They also returned quickly to address a small issue with the original fix without charge. Highly recommended. Thanks again Lev! Colin, it's always sad to see clients with brand new homes that are squeaking. We're glad to have been of service. Lev was very thorough in his assessment and quote for these services. The three gentlemen who completed the work were incredibly skilled, detail-oriented, efficient, courteous, and reliable. We had some very squeaky floors and the team did wonders to silence the squeaks. We now have the occasional crackle of old wood but the squeaks are gone. I would totally recommend this company and their services to anyone looking to silence their squeaky floors. If you can’t afford to completely gut and reconstruct then this topical solution is perfect. Kate, thank you for this review and the kind words. Our team works hard to make sure you get a satisfiying result. We are very pleased to know that you're happy with the results! We have a squeaky floor in one of our bedrooms. Lev came over for an assessment. He was very thorough taking us through the causes of squeaky floors and how Squeak Knights can help with their custom solutions. He spent a good deal of time inspecting the room and patiently answered all my questions. Our home renovation project changed so the bedroom now falls outside of our scope, but should we need help with squeaky floors Squeak Knights will be our first call. Steve, we hope to be able to help in the future. in the meantime, we appreciate the positive review! Squeaky Knights was recommended by our home inspector. Lev walked us through the process in detail and took his time to answer all our questions. He assessed all the areas in great detail that we wanted to fix. Amazing solution that you can't find anywhere else. My hardwood floors were fixed without removing a single panel. The improvement was drastic the first time I walked on it. I am actually calling him back to fix other areas of our house. Highly recommended! Michael, we are so glad you had a great experience working with us! Please pass along a special thank you to your inspector. I had some loud and annoying squeaks coming from different floors of the house. Lev came over and patiently reviewed and assessed each area. He spent the time to go over in detail about the work they do. Once I decided to go ahead with it, the appointment was booked and Irene followed up with a reminder call the week of the appointment. After the job was done, there was an area that needed a touch-up. Lev was very responsive and had this taken care of within a couple days. I would recommend them. We are very happy to be of service. Thank you so much for the supportive words. We hope you enjoy your newly silenced floors! We Had 2 bedrooms and a hall with very squeaky floors. I found this company on the internet and called them up and made an appointment to have an estimate done. The estimator and the crew that came to take care of our floors were very respectful, efficient and helpful. We were very impressed with the process they used. Upon completion my husband and I checked the floors and were pleasantly surprised at how quiet they were. We would highly recommend this company to anyone with squeaky floors. Thank you for your kind words! We always aim to be a pleasure to work with. we hope your silent floor makes your home a little more comfortable. Ok, I'm a fairly fussy guy. I like people to show up when they are supposed to, do a good job, and give me comfort that they will stand behind their work. We had some really bad floor squeaks owing to severe vibration when we demolished our master bath. Really loud in 2 places. So, I searched the web, and found these guys. What they did made sense, but you never know if you are buying a solution or snake oil. I called them, and the owner, Leve, came to my home. He thoroughly convinced me that he was more than capable of solving this. We talked for quite awhile about joists, floors, etc. His background is robotic engineering, and he's quite smart. They booked an appointment for 10am today. They showed up exactly on time. The two gentlemen were extremely knowledgable, and very pleasant. They got right to work, and had an excellent array of tools to do the job properly. The owner developed an excellent solution, and he deserves the business. Arthur, it is because of clients like yourself, who notice and value the hard work we put into getting the job done right, that we keep up the high standard of professionalism at our company. Thank you for such strong words of support. Enjoy your newly silenced floor! Our hardwood floors were very squeeky. Lev came out and spent several hours evaluating our floors. He was so knowledgable and his team was great. We now have slient floors. Sandy and James, we are pleased that you've enjoyed working with us. we hope you'll now enjoy your newly silenced floors! We Silence your Squeaky Floors and Stairs without Replacement! If your floor squeaks, we can silence it quickly and painlessly, often in just one day. 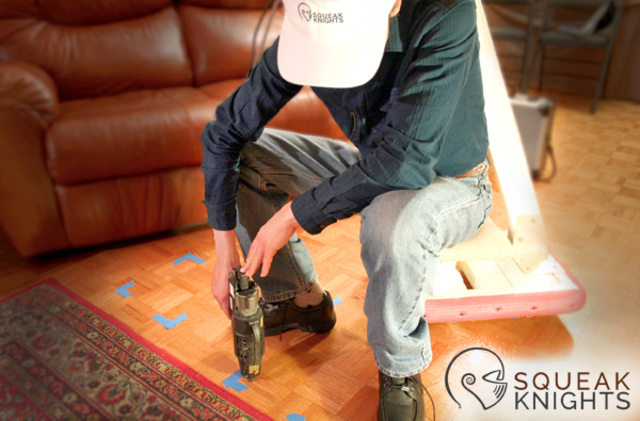 Our technology lastingly secures your floor, eliminating squeaks and strengthening its structure. Our process uses adhesives rather than metal fasteners, so the squeaks are guaranteed not to come back! Squeaky floor repair and silencing for Stairs, Hardwood, Parquet, Carpet, Exposed Sub-floor and some Tile Flooring. 1 year warranty for our service. Warranty term depends on floor conditions.